Getting engaged is one of the most exciting moments in a couples life. But the stress that comes with purchasing a very expensive diamond engagement ring, especially if you do not have the ability to drop mega-bucks on a ring, can often put a damper on the whole thing. Thankfully, it is possible to buy the love of your life an engagement ring she will treasure without putting yourself in a financial crisis. Here are five ring-shopping tips to help you stay within your budget. The first and most effective way to control costs is to compromise on at least one of the four C’s. Diamond color is classified on a scale of D( colorless) to Z( considerable amount of color). If you are looking for a colorless diamond but do not have the budget, consider purchasing a diamond in the G or H class. Both options are nearly colorless, and the hint of color is not really visible to the untrained eye. WS1 and WS2 ( very, very slightly included grades) – Beautiful stones and inclusions only visible through magnification. VS1 and VS2 ( very slightly included) – These selections are some of the best buys for your money, flaws are undetectable to most people. SI1 and SI2 (slightly included grades) – Flaws are noticeable to the naked eye. I1, I2, and I3(included) – On the bottom level of the clarity scale, they are the cheapest and least desirable. While all the Four C’s are vital to determining the overall value of a diamond, the cut has the biggest impact on the diamond’s quality. A diamond’s cut is graded on a sliding scale of poor, good, very good and excellent. A diamond’s cut is a key factor when it comes to the stone’s sparkle and fire. Even diamond with perfect clarity and color can appear dull if the cut is not right. We recommend choosing the highest cut grade your budget allows. Referring to the weight of the diamond, not size, the term “carat” is the most misunderstood category in the Four C’s. Essentially, the more a stone weighs, the greater the carat and the more valuable the stone. If you are looking to save money but do not want to sacrifice any other the other categories, choosing a smaller carat is an easy choice. Get a unique and stunning ring by choosing a ring with an intricate setting. Not only will this add to the beauty of the ring but the right setting can create an optical illusion of a bigger stone! 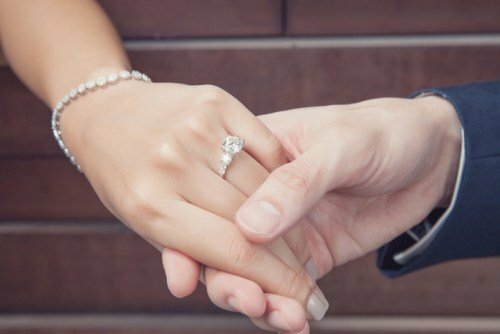 While it seems counter-intuitive, creating a custom engagement ring can often be less expensive than purchasing a designer ring from a jeweler. It is important to note that many retailers mark up the prices of their designer rings, resulting in much more expensive prices. At The Diamond Reserve, our diamond brokers help clients design the ring of their dreams at a wholesale price. For the more non-traditional brides, we recommend considering other gemstones. Non-diamond rings such as emeralds, sapphires, and tanzanite are often less expensive, and you can typically upgrade the size of the stone. Shopping for diamond engagement rings is one of the most exciting times in life. These tips can help you keep your feet on the ground, so you don’t get carried away by emotion and make a big mistake. Don’t forget to keep your budget in mind and schedule a consultation with The Diamond Reserve.